Today we’re going to talk about something a bit different. I’ve uploaded my daily picture from Taiwan after midnight but WordPress considers it as it if was posted on the 5th due to different timezones. I may have to change the name of the project to:”Taiwan:A Picture a Day, unless I post too early, in which case it will 2 pictures a day followed by a no-pic day”. I’ll see if the title fits. BACK IN TOPIC! Let’s talk about bicycles. I’ve bought this bike, the Fuji Gran Fondo 2.7, around a month and a half ago and I’ve been riding it on many different surfaces. As you can tell from how dirty it looks in the pictures I’ve also enjoyed a bit of off-road by the sea. a) Why did you pick up a full carbon bike for touring? b) Why did you pick a relatively heavy carbon bike with Tiagra components and stock wheels? By the end of my review, everything will be explained. Let’s talk about the purpose of this bike. Is it a racing bike? Nope. It’s an endurance bike. I personally find regular road bikes to be extremely uncomfortable due to the extremely low position of the handlebars. The Gran Fondo series from Fuji, as well as the Ride series from Merida and many others, are all built in order to fix that problem. The frame has a slightly more relaxed geometry and the handlebar is a bit higher than usual, which leads to an overall increased comfort for my back. Some people may argue:”With a more upright position you’re less aerodynamic and you’re not optimizing your power transmission to the pedals”, well, if my back starts to feel hurt after 40kms then my power transmission has to be invested into pushing the bike with my arms on the side of the road, so I can definitely live with that sub-obtimal configuration.. I don’t like steel because the weight of the bike saps my spirit while riding uphill, and while I consider alloy good for city bikes or recreational road bikes, if I have a 100kms ride across the mountains ahead of me I want something stiffer. So this bike has all the right features for me: reasonably light, stiff carbon frame, relaxed geometry. Components are fine as well. I’d have preferred a shinier 105 or Ultegra set but that would have increased the price by a lot, and the 2.5 version of this bike is one of the worst looking bikes I’ve ever seen in term of color. It’s just that ugly, so utterly ugly that I don’t even dare to find a picture of that to link it here. If you dare, Google Fuji Gran Fondo 2.5 and be prepared for the horror. In terms of performance Tiagra works perfectly fine, and since all the 10 speed Shimano sets are interchangeable it will be easier in the future to replace broken/wore out parts with something a bit better. Luckily I don’t suffer too much by Upgraditis, I tend to upgrade/replace stuff only when it gets broken/damaged or if I need something very specific. So, Tiagra is pretty good, what about the rest of the components? 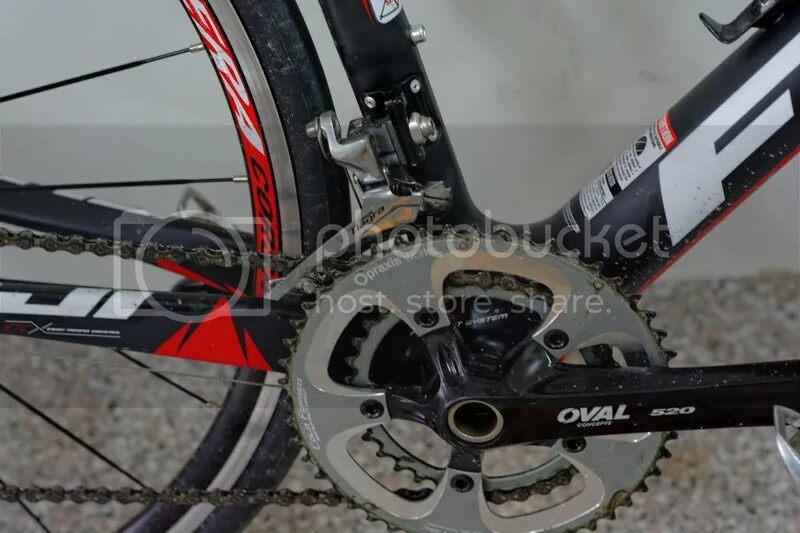 The chainset is phenomenal. Well, let me rephrase: the crank arms are pretty “meh”, but the Praxis 50/34t rings are phenomenal. 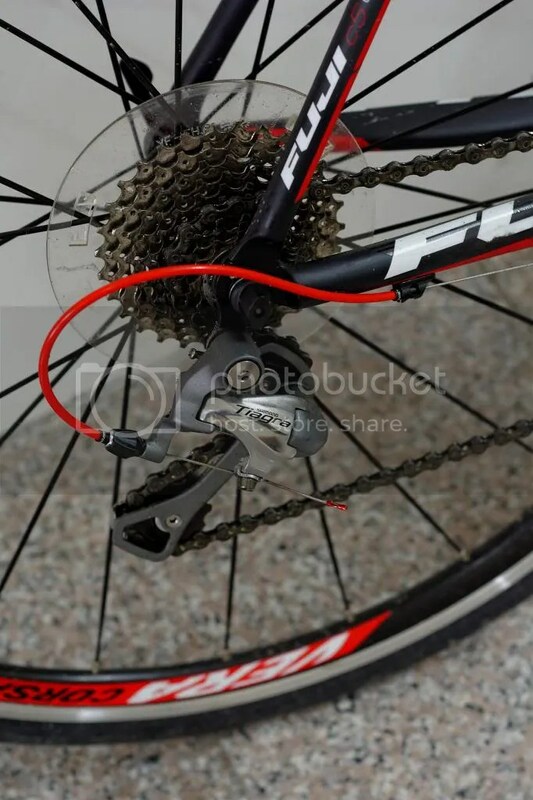 It’s very uncommon to find this kind of component in a mid-spec bike like this one, so I was pretty impressed by the choice made by Fuji here. If you’ve never heard of Praxis, they’re cold forged rings, which means an ice elemental is spending his own existence hammering them until he’ll finally manage to produce the perfect equipment. At least that’s what I’ve heard. The chain is from Kmc, a pretty solid choice. Some people tend to prefer Shimano, but quite a lot of Shimano chains are actually made from Kmc, so moneywise it makes sense to stick with Kmc. Brakes are from Tektro, a very common choice in order to shave off a bit of production cost. I neither love them nor hate them, but there’s a lot of room for improvement here. 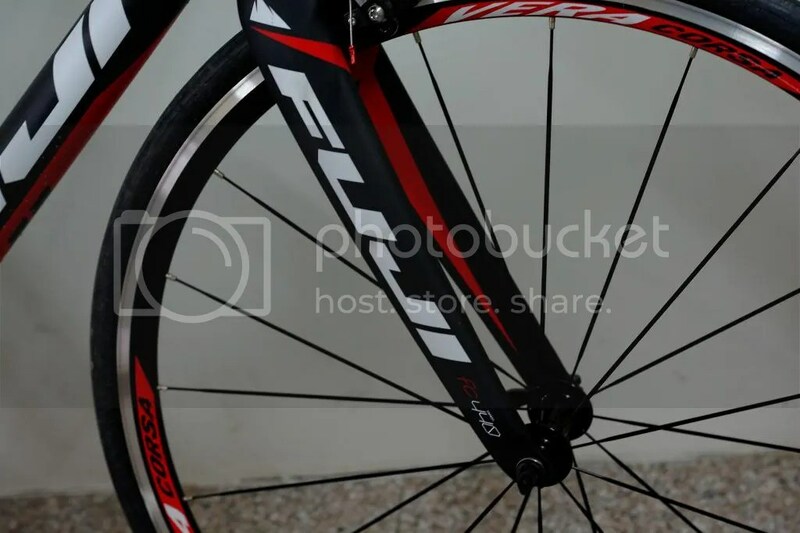 All the bits and pieces are branded Oval, which is Fuji’s own brand of components. It’s hard to give you an opinion about the saddle because everyone has different requirements when it comes to the “lower part” of our body. It’s not the worst saddle I’ve ever tried (that title goes to a saddle from Scott that I threw in the rubbish after one week), but it’s far from being comfortable for me. The seatpost is full carbon, which is pretty nice. Handlebars are made of alloy which makes perfect sense to me. Upgrading to carbon handlebars is not giving you much in terms of weight saving, but it’s a major investment. Everything good so far! So it’s a pretty awesome bike, and…. Ok, maybe I’m exaggerating a bit, but I kept the painful part for the end of my review. Just by noticing the number of spokes you may start to think that this is a heavy wheelset. And you wouldn’t be wrong. The good news is: it’s not a HORRIBLE wheelset either. Considering that it’s a stock set of wheels they’re actually pretty reasonable, they feel much better than the last stock set I used a few years ago (some Alex Rims that felt like a bag of bricks). They’re pretty tough too, which is quite useful if you’re like me and you ride your road bike even where there are no roads. But honestly, if you plan to do a lot of proper road riding, be it on flat roads or uphill, you should seriously consider upgrading the wheels, and keep the Vera Corsa set for the winter as a training set that will work fine on harsh roads. The Vittoria Zaffiro tires are not a bad set at all, but I prefer Continental GP4000s. Done talking about the components, how’s the ride? The ride is very smooth and comfortable. You’ll not get the same results you may achieve from a sub-8kg bike with a more race oriented geometry, but that’s not the purpose of this bike. 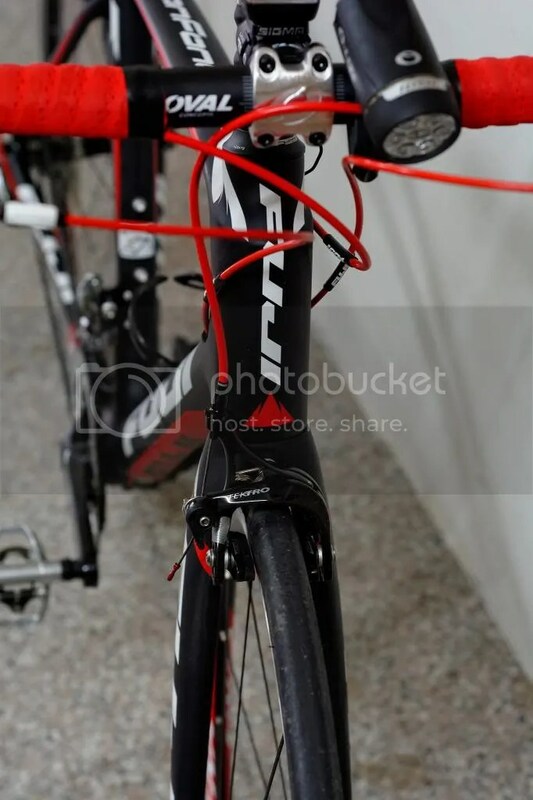 The full carbon frame and fork do a good job and the ride is extremely pleasant. If you’re looking for some ego-boosting KOTH on Strava this is not the bike for you, but if you enjoy long rides you’ll love it. UNLESS you spend a lot of time riding uphill, in which case you may want to upgrade the wheelset asap. Full carbon frame, fork and seatpost. Tiagra Components + Praxis rings. Not the fastest or lightest carbon bike out there. Brakes are a bit weak and especially if you tend to corner aggressively you should replace them (at least the pads). Wheels have a lot of room for improvement. I decided to write the price under the PLUS category, but that depends highly on your country. To give you an idea, in most countries the retail price is around 2000us$. 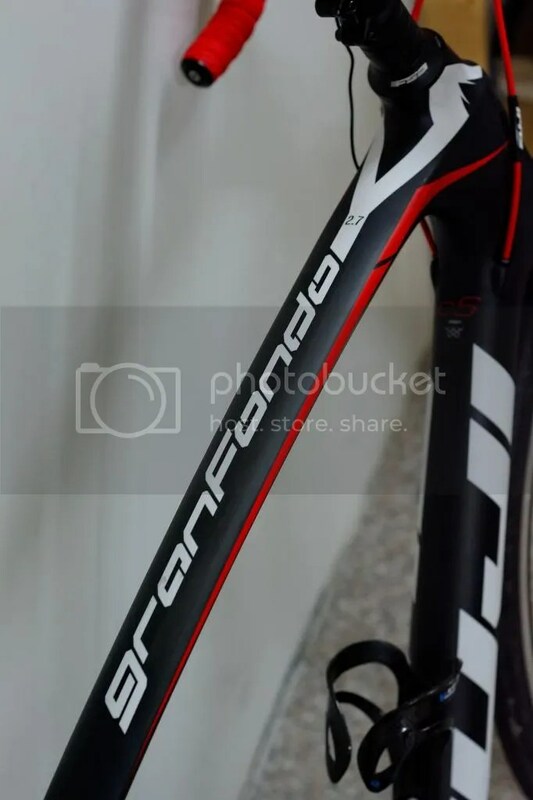 A lot of stores will offer it at much less than that, personally I got for just a bit more than 800us$ because it was the model that had been used for the Test Ride day, and the fact that the bikes are assembled not far from where I live means that the regular price would be around 1200us$. If you want a great wheelset to match the bike, go for Campagnolo Zonda. They’re light, won’t break the bank and the colors from Campagnolo are a match made in heaven for this bike. My first picture of the new year, and the starting point of my touring and photography project! 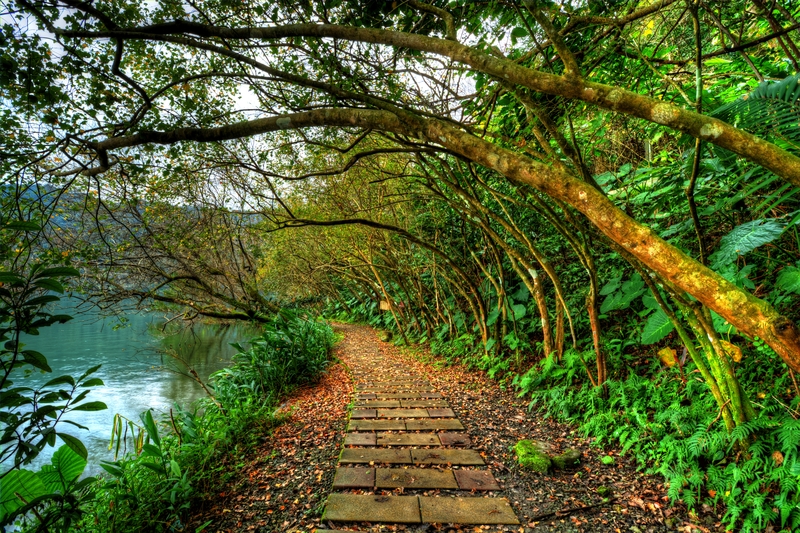 The place is Plum Blossom Lake – 梅花湖, a nice little lake in the north-east region of Yilan – 宜蘭. Getting there is a breeze for me, less then 8kms from where I live, but since today the weather was not totally horrible (aka: it was not raining), I decided to take pictures in many different places including a botanic garden on the side of a mountain and the small lake full of logs where I’ve already been previously. The whole ride became much more challenging, but definitely enjoyable. Moreover, today was my first day with my new lens, the Tokina 11-16mm, I took many picture because I was really looking forward to some nice test field. Loving it so far, even though chromatic aberrations are a bit painful. Plum Blossom Lake is guarded by a giant temple (little teaser here!) and surrounded by a bicycle path. As today was the first day without rain in weeks the place was crowded with visitors of all ages, trying to enjoy some time far from the city. If you want to spend a bit of time riding a bike around a nice and quiet lake, have a picnic and breath some fresh air, go for it! Just watch out for the local food: it’s a typical tourist area, which means prices tend to be 30/40/50% higher than in the city. The location where I took this picture is a very small lane the runs just next to the lake and is not used by a lot of visitors. Most people prefer the bike path which is a few meters uphill on the right. Due to the lack of people I managed to get a nice, clear picture. This place has almost everything that I love: trees with oddly shaped branches, big tropical plants, water and a nice sunrise or sunset. Well, I said ALMOST, didn’t it? Composition: I’d have preferred the path to be slightly more to the right, but if I did so I’d have been forced to include in my picture a part of the lake with nothing particular and a horrible building on the far left…not going to happen. Ever since I was kid I’ve often heard things like:”Forget about your destination, enjoy the journey”, but I’ve never really cared about that. Even if I’ve always loved travelling, I considered the journey a way to get from point A to point B, and my task was usually to make it as quick and efficient as possible because after all B was my destination, my goal. It did not matter how I was getting there: running, hiking, cycling, on a plane, on a boat…my main focus had always been on B. Then something changed a few years back. It was one of those days when nothing particular happens. I went to work, then back home, played a bit with my PC, booked a flight to Australia and started planning to travel it by bicycle. Just the regular stuff. Unfortunately after 6 months of planning and over 3000kms I injured my back in a way that abruptly trashed my plan, but that’s a whole different story. When I landed in Melbourne after a flight that felt like a bottomless pit (Milan-Rome-Dubai-Kuala Lumpur-Melbourne, just kill me…) it was around 1.30am on a rainy August night. I quickly jumped on the shuttle bus and I crawled my way inside a hotel room that became my home for about a week. During that week I had to check everything on my shopping list to make sure that I was prepared for the ride, so I spent quite a bit of time shopping in outdoor stores for a tent and some basic tools, some extra cycling gear and so on. Apart from my shopping spree I behaved like a regular tourist, visiting all the famous locations of the city, enjoying some fine Australian wine (and even though I’m Italian, I have to admit the white Ozzy wines are absolutely phenomenal and much better than most of what I’ve had in Italy) and taking a lot of pictures. 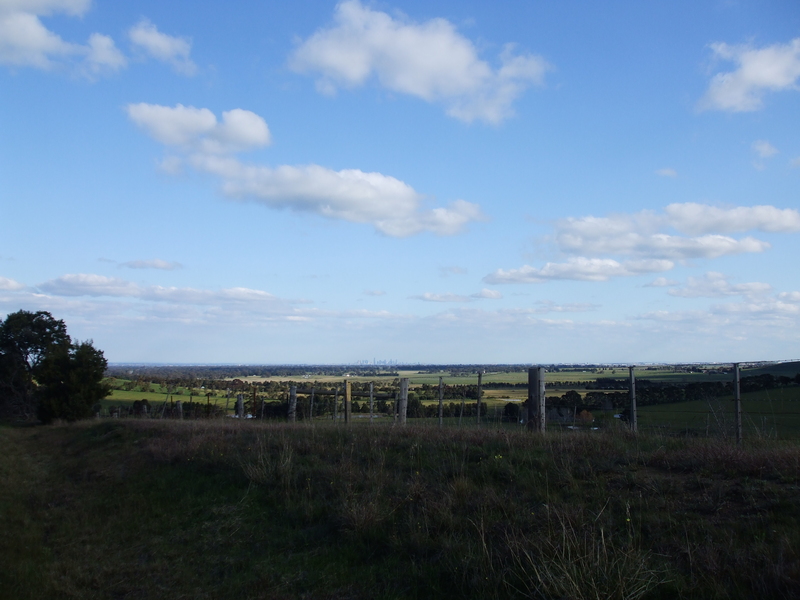 Then I jumped on my bike and I started to make my way in direction of my first stop, a small town (un)known by the name of Heathcote. 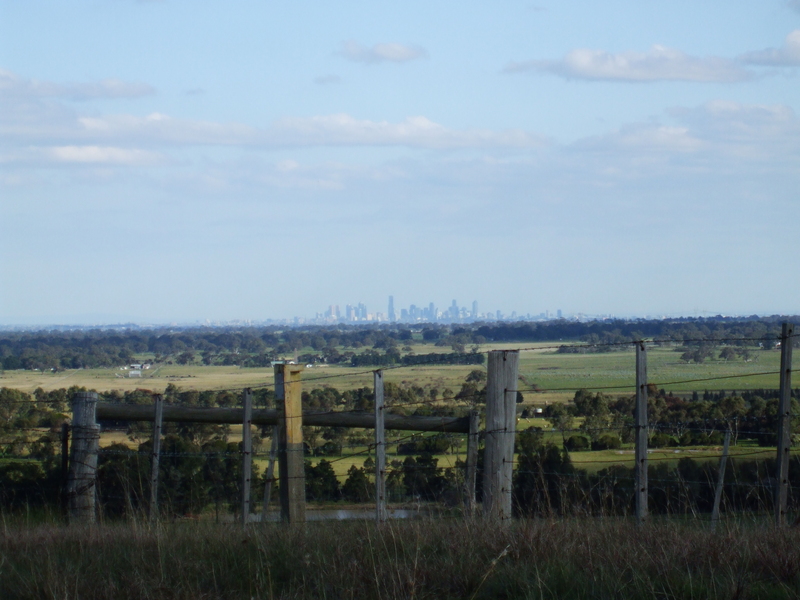 The distance from Melbourne is around 100kms, so it was supposed to be just a nice ride on mostly flat roads that I had planned to divide evenly between the morning and the afternoon. My mp3 player started pumping some power metal and off I went. I just kept going, focusing on the road and being careful as to drive on the correct side of the road. Then the road suddenly had a very long turn to the left, in order to run around a small hill, and that allowed be to have a look back where I came from. The skyline from Melbourne, that looked so massive and imposing while I was strolling around those streets, felt so small and faraway. I cannot exactly remember how far I was from the city, but I started to look back, to have an idea of what I managed to achieve so far. And then I thought that from the moment I left the hotel to moment I took those pictures, a lot of things happened. While I was riding through a park I stumbled upon a small rock: no big deal, but the guys at the bike store didn’t fix the rear skewer properly (and I didn’t check it as well), so I had a nice landing on a grass field where I had to spend a good 20 minutes recovering all my stuff, checking that everything still worked and swearing profusely in some general direction. When I left the CBD of Melbourne and I started to make my way through the suburbs I passed by a bench in the middle of nowhere where I sit for 5 minutes having a small snack (leftover Subway Marinara from the previous day) and I shared part of it with a stray dog. I passed by a place called Batman Park. Suddenly all the small things that I experienced during my ride started to play a much bigger role inside of my mind, while at the same time the “regular” stuff slowly started to fade away. When someone asks me about Australia, they often expect names like Melbourne, Sydney, Adelaide, the Great Ocean Drive and many others. But when I hear the name “Australia”, the things that immediately and spontaneously come to my mind are not the destinations, rather the journey itself. I’d not be able to say much about the beautiful Botanic Gardens in Melbourne, but I could describe the moment and the place when the wind suddenly started to blow from North-West making my progress much slower, and I decided to take a slightly longer but wind-friendlier rout to a small town called Seymour, that it is now known as “The Place Where I Lost My GPS”. I don’t remember where I’ve had meals in Melbourne, but I could get back to that awesome chinese takeaway restaurant in Seymour even blindfolded. Would you like some details about surfing? Can’t help you, but I can easily lead you to one of the best mixed grills I’ve ever had. That’s in Heathcote, a place that became my second home for a few days because a truck almost hit me and I fell off the road, expect this time I landed on concrete and I rode the last 10kms while bleeding from a leg. And the day when I run out of water because my my big 5l tank was leaking and, in the middle of nowhere, I decided to take my chances and drank the water from a lake, trying to filter it by simply digging a hole next to it (and it worked out fine!). Everything from that journey is still vivid in my memory, even the smallest details. Some may say:”Well, it was a special journey, it’s kind of obvious that you can remember it so clearly”. But the point in this case in not just about the memory of the journey, but my personal attitude towards it. A 5kms ride that now takes me to a small park near home has become a 5kms ride where I keep my eyes open to see the things around me, to notice what people do, to find something special worth remembering. A few years ago I’d have never payed attention to a dog that looked at the guy in front of me without paying too much attention, and then suddenly opened his eyes while I was passing by, staring at me as if I was an alien (well, technically I am, but that was still kinda racist of him). This picture? I took it between two famous waterfalls, I was stunned by the beauty of the water laying on the web during that rainy day, while the spider who built it probably went abroad looking for some better weather. Everyone who was walking on that path missed it because they were too focused on the two waterfalls, and only one other guy realized there was something beautiful underneath the trees when he noticed that I was in an awkward position trying to get a picture. This idea of “slowing down” works especially well if you’re interested in photography, because if you start to carefully looking around yourself you’ll notice that the pictures you prefer are those that represent a story (or part of it), or something special and unexpected that you found at the most unusual time or place, rather than the same picture of a building or monument that everyone has, and that you’ve already seen a million times. Behind me there was a beautiful and famous lake inside a park, but it was a rainy day and I did not find it particularly interesting, while that girl slowly walking away on that lane while carrying her umbrella immediately got my attention, and it’s still the moment that I remember most clearly from that day. I’ve learned that getting to your destination is only a matter of time, but being able to enjoy the journey is not just a nice quote over the internet, it’s actually a way to see things in a different way. It may take you a bit longer to get to your point B, but slowing down and having a look all around you may lead you to endless discoveries.